Actual Size Gallery in Chinatown, Los Angeles, currently exhibits “Borderlands”, a compact yet well-curated show with works by four artists, two of which are Israelis, contemplating the issue of an individual’s confrontation with national and geographical border lines. Entering the space, the visitor is surrounded by Daniel Kiczales’ and Rona Yefman’s video works, that are facing one another from opposite walls. 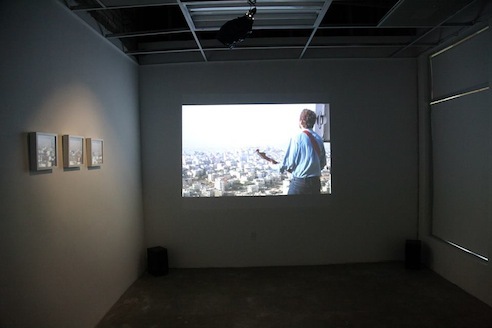 Kiczales’ work, “The Messenger”, dominates the space with a wall screening, featuring the artist seen from his back, while holding and playing an electric guitar. For an Israeli eye it is not hard to recognize that he is standing on the hill across from the Issawiya neighborhood, a familiar view to all the students at the Hebrew university and Bezalel academy on Mount Scopus. The eastern prayer of the muezzin overlaps the western sound of his rock notes, at times dominating it, and at times flowing simultaneously in harmony. 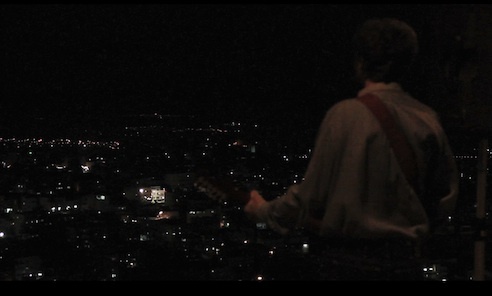 The artist might be perceived as a secular prophet, standing at the top of the hill, ready to send his peaceful speech. Does this work yields for mutual correspondence, or does it realizes the unbridgeable gap between the neighbors? Yefman’s work, “Pippi Longstocking in Abu Dis”, presents the female figure of the Swedish child heroine, who tries to bring apart the separation wall between Israel and the Arab villages in the west bank. As if trying to follow the steps of biblical Samson, the red-headed girl is eager to tear down the erected cement monument, while being encouraged and blessed by a Palestinian woman who happens to walk by. Three young men laughs at Pippi’s act, pretending to help her with the impossible mission, and leaving the place only a few seconds afterwards. In an accompanying statement, Yefman mentions she identifies with Pippi Longstocking as her alter-ego, since both are “rebellious with socially subversive ideas”. Watching the video, I couldn’t help but feeling that Yefman criticizes not only those who built the wall, but also those, who are outsiders to the middle-eastern situation, who naively think it can be so easily dismissed. 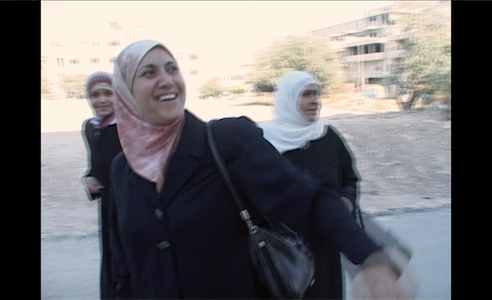 Collaborator Danish artist, Tanja Schlander, who plays Longstocking in the video, presents “Abu Dis”, a smaller version of her 2009 sound installation, that was conceived while shooting the video with Yefman. 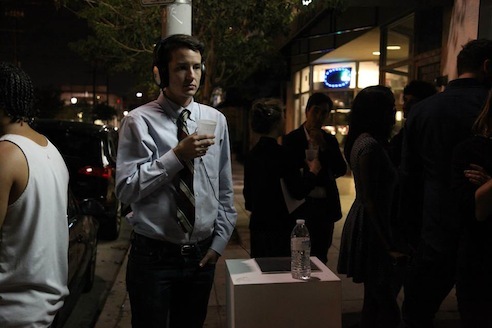 An individual visitor is invited to put headphones and listen to sounds of scratching and dragging, while flipping through a booklet with colorful pages, each with a ton that ranges from sunset orange and blue sky to gray cement. 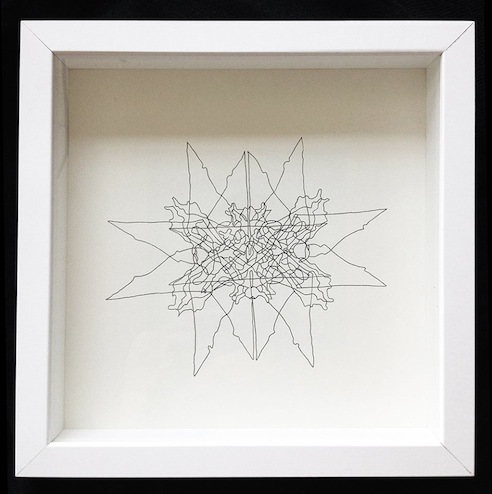 The curator and artist, Corrie Siegel, who initiated the show following a visit in Israel, and more specifically at the recently closed Jaffa 23 art space, where she saw Daniel Kiczales’ work, presents four framed black and white drawings. 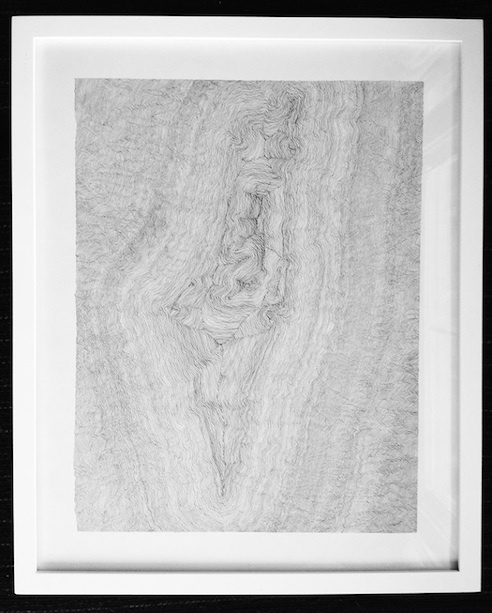 As if trying to reflect the temporary nature of border marking, Siegel breaks the outlines of the map of Israel, creating a triptych of Rorschach abstractions, which might seem as rockets, bombs and the Star of David. A forth drawing brings to mind a stone that was thrown into water, where the outlines melt like ripples, as if they were seemingly lucid and arbitrary. Siegel is a current fellow in the Six Points Fellowship, a program supporting emerging Jewish artists, by the Foundation for Jewish Culture.